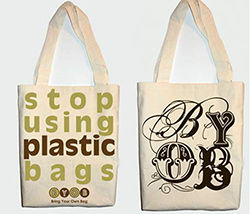 Why Use Reusable Bags To Promote Your Business? Why Custom Reusable Bags? Disposable plastic bags are a plague on the planet, with somewhere between 500 billion and 1 trillion plastic bags produced and used each year. The average person uses between 380 and 500 disposable plastic bags per year – at least a new bag every day. 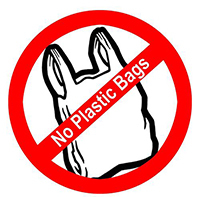 Plastic bags don’t biodegrade – they photodegrade, meaning that the plastic breaks up into smaller chunks of plastic. Those smaller chunks are just as artificial and toxic as the original bag – but now the fragments are smaller and enter the food chain more easily. Even photodegradadation takes up to 1,000 years to happen in a landfill – imagine what the world would look like if the garbage produced by your great-(40-times)-grandparents, and everyone born since their time, was still sitting around. The vast majority of plastic bags are not reused – less than one percent in some countries. Even in the most recycling-friendly areas, 90% or more of bags are used once, then thrown away. Literally millions of tons of disposable plastic bags are produced each year, and nearly all of them end up in landfills, or worse yet, in our rivers and waterways. That plastic waste is estimated to kill more than 1 million sea creatures (fish, birds, and mammals) every year. Fully 70% of disposable plastic bags end up in the ocean. RPETAlthough the situation is grim, there are things that consumers and companies can do to help. Though most bags are never recycled, most people *want* to recycle them. More than 90% of Americans recycle at least some of their plastic bags. Their hearts are in the right place – they want to do things right! Unfortunately, the two most common responses to the problem are “let’s ban plastic bags” and “let’s switch to paper”. Banning plastic bags simply shifts consumers into using paper bags – and paper bags are actually worse for the environment than disposable plastic! They do degrade – but they cost far more to make, use far more energy, and burn far more fuel (because they are much heavier than plastic) in being transported for use. Plastic isn’t good, but paper is worse. The right solution is to impose costs on the use of disposable plastic bags, and to encourage individual consumers to start using reusable bags. Consumers want reusable bags – they would use disposable bags over and over again, if they were durable instead of flimsy. In Ireland in 2001, the government imposed a very nominal fee for the use of disposable plastic bags – just a few cents per bag used. The result was dramatic – people switched to reusable bags en masse. The production and use of disposable plastic bags dropped by almost 95% – a person who had previously used 300 disposable bags a year now used about 20. Some companies have done very well, in Ireland and in other countries, selling reusable bags to consumers. Consumers are eager for these bags – so eager that once they have them, they use them over and over again. The consumption figures in Ireland indicate that the typical consumer is using reusable bags at least 20 times per year. Every time a consumer goes out shopping with a reusable bag, that bag is seen by dozens or even hundreds of other consumers. Any logo or corporate branding message on that bag is similarly visible. How much would you pay someone to walk around the shops carrying an ad for your company, product, or service? $50 per day? $100? Yet providing that person with a reusable bag with your company’s ad on it would cost you only .49 cents – and the person would want to carry your message around with them. Promotional giveaways of reusable bags of high quality, carrying a compelling company identification or marketing message, are the most cost-effective method of advertising products or services invented in the last hundred years. Durable, high-quality, long-wearing reusable bags are much less expensive than you might think. In quantities of 1,000 or more, outstanding shopping bags (which lasts for years) cost just .49 cents apiece. The image-boosting impact of a promotional bag giveaway will be immediate and large. The long-term benefits are even greater. Many studies indicate that marketing messages become more effective with repetition – the “golden number” is anywhere from 5 to 20 times, depending on who you ask. Every time your customer takes their promotional bag shopping, or uses it to carry things conveniently, or just looks at it in the car, is another advertising impression. Every time they take their bag in public, it’s dozens or hundred of impressions to the people around your customer. Your customers won’t think they’re doing you a favor by carrying your ad around – they will consider that you have done THEM a favor, by giving them a bag! Marketing research indicates that people who believe they have been given something of value are FAR more likely to continue doing business with the company that was generous to them, and FAR more likely to make referrals and recommendations for that company. The moment is ripe to market your company with this innovative, money-saving, and highly effective approach. More and more consumers are turning to a “green” ethic of sustainable lifestyles, reuse of materials, and a commitment to living a more environmentally conscious life. For literally pennies per customer, you can permanently associate your company with this new way of living and harvest enormous returns on your advertising investment almost as a side benefit. There’s never been a better time for promoting your business with high-quality durable reusable bags – contact our support team at 866-222-0949 to find out more. Previous Previous post: Looking For The Best Custom Reusable Bags?